Last year, it was Liz Moynihan’s (LA ’14) desperation 3-pointer at the buzzer in overtime that carried the Jumbos through the second round of the NCAA Div. III tournament, keeping their Final Four hopes alive. While this year’s opening rounds at Cousens didn’t end with quite the same photo finish, for the second year in a row, the Jumbos overcame a tough overtime matchup to advance to the Sweet 16 for the fourth time in as many years. Tufts didn’t lead once throughout regulation in the Round of 32 contest against the St. John Fisher Cardinals, but a baseline jumper in the final seconds of regulation from sophomore Michela North tied the game at 60-60. From there, Tufts was able to take control of the momentum in the extra period of play and earn the victory. St. John Fisher gave Tufts plenty of trouble with tight defensive play, doubling the ball when it entered the paint and coming up with steals that it converted into fast-break points. In the first half, Tufts turned the ball over nine times and shot just 26.5 percent from the floor. North, who exploded for 21 first-half points in Tufts’ first round matchup on Friday with the Pine Manor College Gators, was held to six points on Saturday, while senior tri-captain Hayley Kanner shot just 1 of 6 from the floor for five points in the first half. The game was never out of reach for the Jumbos, but throughout regulation the Cardinals were always able to match any offensive spurt the Jumbos could put together. Junior Mary Kate Cusack gave the Jumbos trouble on both sides of the ball, hitting big 3-pointers to extend the Cardinals’ lead as well as playing tight zone defense to pick up steals. Senior co-captains Sydney Bloomstein and Portia Velasco also led the Cardinals with high shooting percentages and an ability to finish easy layups down low. St. John Fisher had built a four-point lead heading into intermission. 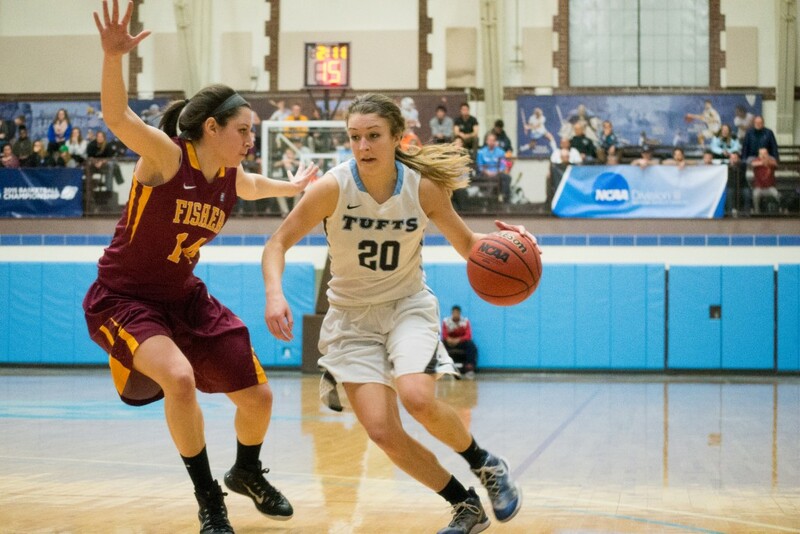 In the second half, however, Tufts clawed its way back with clutch shooting and lockdown defense. Roberson matched up with Cusack and the other guard scorers on the Cardinals, playing stellar defense to slow down the fast-paced attack from the Cardinals. At the same time, Morehead stepped up huge offensively, scoring 16 of her game-high 19 points in the second half and overtime periods. Morehead also sparked the Jumbos offensively with her 3-point shooting, hitting five of 10 shots from downtown at a time when the rest of the team was struggling from beyond the arc and needed big buckets to stay in the game. Since her return, Morehead has gotten the opportunity to play both the 1- and 2-guard positions, meaning she can both orchestrate the offense at point guard to create opportunities for others, and also take on a more scoring-oriented position if first-year point guard Lauren Dillon, who ran the point for most of the season, is on the floor at the same time. This has led to an increased scoring role for Morehead and an added dimension to the team’s offensive capabilities with her and Dillon generating offense together. The duo has helped spark perimeter scoring for the Jumbos following the injury to senior tri-captain guard Hannah Foley. Other key contributions came from Kanner, whose and-one layup at the 8:17 mark kicked off the late comeback surge and got the crowd into the game. North, despite struggling from the line (2-7), also played a pivotal role, battling down low to convert on shots the Jumbos needed if they were going to advance past the Cardinals. Although Tufts had a definitive size advantage over St. John Fisher, which only has one player on its roster 6’0″ or taller, St. John Fisher found success packing the paint with defenders and double-teaming Tufts’ front court when the ball was dumped down low. This gave Tufts trouble when it couldn’t knock down outside shots when the ball was kicked back out. Slowly, though, Kanner and North found some rhythm, and aided by strong scoring from Morehead, Roberson and sophomore guard Josie Lee, it proved to be enough to get the win. Velasco and Bloomstein finished with team-highs of 17 points apiece, while Cusack scored 15 points with three makes from beyond the arc and three steals. Four Jumbos finished in double-digits for scoring: Morehead (19), North (18), Kanner (13) and Roberson (10). North posted a double-double with 14 rebounds, while Kanner and Roberson each pulled in eight rebounds and Lee grabbed five. Six of Roberson’s eight rebounds were on the offensive glass. The Friday night first-round matchup with Pine Manor College was a totally different experience for Tufts. Presented with another notable size advantage, the Jumbos had their way offensively in an 87-46 routing of the Gators. Pine Manor, which averaged over 70 points per game with a high-powered, fast-paced offense during the regular season, was stymied in the team’s opening game of the NCAA tournament, shooting just 33.9 percent from the floor and 8.3 percent from beyond the arc. Tufts outscored Pine Manor 52-32 in the paint and controlled the pace of the game from start to finish. North tied her career-high of 25 points and also finished with a game-high 13 rebounds. 12 Jumbos scored in the contest, and Tufts had 37 points off the bench. Senior Hannah Artner, one of those coming off the bench, scored eight points and grabbed four rebounds for the Jumbos. The Gators were led by first-year Erica Jones’ 16 points and four rebounds and sophomore co-captain Maria Vaughan’s 12 points and four rebounds. With the wins this weekend, Tufts has earned hosting rights for the next round of the tournament, meaning the Jumbos will be at home for another set of weekend games. Tufts will take on Eastern Connecticut State University on Friday night; a win would send the team on to either Fairleigh Dickinson University-Florham or SUNY-Geneseo on Saturday. For a team that’s undefeated at home and in search of another Final Four berth, this advantage is crucial.